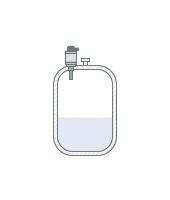 Filling level measurement involves determining the filling level of media in industrial containers, such as process and storage tanks, silos or open channels. This is achieved by converting measured values into electronic signals. The signal issued is integrated into the control circuit of the relevant process control system. In this context, a distinction is made between continuous measuring methods and limit value sensors. The following section sets out to explain the various types in greater detail and to highlight the advantages of the principles. The transmitter emits an ultrasonic wave at a surface, which then reflects the signal. By using the signal delay time, the device can calculate the distance from the sensor lower edge to the surface. The influence of the speed of sound, which itself is dependent on the surrounding atmosphere, is automatically compensated for by the transmitter based on the input of specific values and measurement of the ambient temperature. 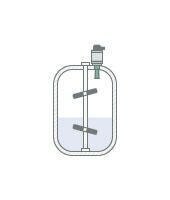 If the distance between the sensor lower edge and the bottom of a container is known, the device can display the fill level. If the container geometry is known, then the volume can also be determined. With the help of various disturbance echo filters, the system can also be used inside containers – even if built-in fixtures generate disturbing echoes. The underlying measuring principle used in ultrasonic filling level meters makes them suitable for various applications. This makes them particularly useful in open basins and in waste-water applications as well as in silos or tanks of chemical and dairy plants. Here, the advantages of non-contact measurement really come into their own. That's because the level of contamination of the water or silting in the basin does not affect the measurement result. What’s more, the fact that there is no direct contact with the medium also enables applications with strict hygiene requirements. The radar measuring device consists of a housing containing the electronics, a process connection with an antenna and a sensor. The radar sensor transmits brief radar pulses with a duration of approximately 1 ns from the antenna. These pulses are reflected by the filling material and received by the antenna as echoes. Radar waves are propagated at the speed of light. The delay time of the radar pulses from transmission to reception is proportional to the distance and therefore to the filling level. The filling level determined in this way is converted into a corresponding output signal and issued as a measured value. The filling level sensors are frequently used for aggressive media as well as dynamic process conditions, such as high temperatures or pressure fluctuations. As with the ultrasonic measurement, the measurements in this case are performed without contact. Since no direct contact with the medium is required, the measuring principle is ideal for hygienic applications. Production processes for yoghurt products run in a controlled manner in highly sterile environments. This places particular demands on the cleanability of all parts coming into contact with the medium. Consequently, the cleaning processes used are extreme because any contamination by external bacteria results in the loss of the entire batch. The non-contact radar principle is impervious to the changing density of the yoghurt and remains unaffected by abrasion due to the fruit. 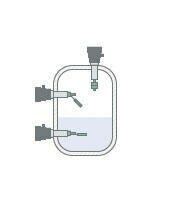 Furthermore, the non-contact measurement is not sensitive to pressure and vacuum influences and is suitable for filling level measurements in storage tanks. To decompose bauxite in this application, a dilute caustic-soda solution is added to the mixer and mixed with the bauxite. It is important to maintain the filling level within a defined range in order to optimise the process yield. The radar measuring device detects the current filling level and forwards this to the control system. Even the circulating agitators do not interfere with the measurement. The prevailing vapour atmosphere is also of no consequence. High-frequency radarsignals are guided along a bar or a steel cable. As soon as the media surface is reached, these waves are reflected and received by the sensor. Based on the delay time of the waves, the filling level is determined and issued as a measured value. 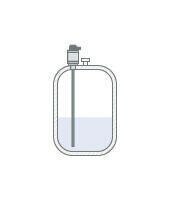 A floater is a type of sensor whose low density allows it to float on the surface of the liquid. Inside the floater, there is a magnet as well as one or more reed contacts. When the defined filling level is reached, the buoyancy causes the magnet to activate the reed contacts. In the process, measurement is carried out independent of influences such as pressure, temperature, conductivity and bubble formation in the media. As a result, the principle can be used for various applications such as in foaming media or dynamic surfaces as well as across wide temperature ranges. 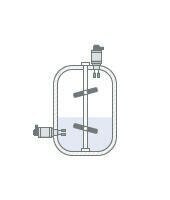 A tuning fork is installed in the tank. This tuning fork is s energized piezo-electrically and oscillates at its mechanical resonance frequency of approximately 1,200 Hz. The oscillation frequency changes in contact with media. The frequency change is detected by the integrated oscillator and converted into a switching command. Are you looking for filling level measurement devices for your unique situation? Find suitable products for liquid level measurement now!